Personalized Music Tote Bag. The perfect gift for the music enthusiast. All around lightweight tote bag to carry sheet music back and forth to lessons, class or the studio. Can be personalized with teacher or student name for a keepsake gift. Music tote bag measures 12�W x 13" x 3" across bottom. 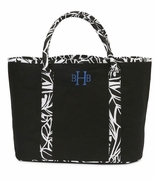 This is an open tote that is tapestry woven, unlined interior with web handles.